What kind of book is dangerous enough to be considered burnable? In medieval London, where the decapitated heads of traitors welcomed visitors to the city, a manuscript prophesizing the king’s assassination kindles everyone’s interest. Even the esteemed poet Geoffrey Chaucer wants to lay hands on the volume, and he employs his street-smart fellow poet, John Gower, to find it. 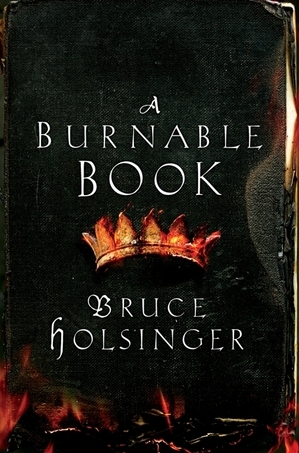 Such is the premise of A Burnable Book (William Morrow, $25.99), the stellar debut novel by Bruce Holsinger, a medieval scholar at the University of Virginia. Things really heat up when a beautiful and unknown young woman is murdered in the Moorfields outside of the city walls, the only witness a prostitute hiding in the bushes with a book in her hands given to her by the recently deceased. It is a compelling beginning, and Holsinger proves himself adept at creating colorful main characters and capturing the largely unpleasant sights and smells of London in 1385. As the murders mount and Chaucer turns testy, Gower is unsure whom to trust. His estranged son’s return to London further upends his life. But as he plumbs the sleazy world of paid mercenaries, rivalrous courtiers, and bishops’ bawds, the secrets of the treasonous text reveal deadly ambitions. Whether you label it biblio-fiction or historical fiction, The Burnable Book thoroughly exceeds expectations. May this novel be the first of many from Holsinger. The author is on tour now; check out his website, and you might catch a reading. What kind of book is dangerous enough to be considered burnable? In medieval London, where the decapitated heads of traitors welcomed visitors to the city, a manuscript prophesizing the king's assassination kindles everyone's interest. Even the esteemed poet Geoffrey Chaucer wants to lay hands on the volume, and he employs his street-smart fellow poet, John Gower, to find it. The manuscript, Liber de Mortibus Regum Anglorum, eludes Gower as the maudlyn and her conspirators try to determine its value and its meaning. Bibliophiles will take special note of Gower's book-hunting trip to Oxford, where he spends a week sorting through Richard de Bury's library. "The first thing I noticed about the dark space was the smell: rich, deep, gorgeous. Cardamon, I thought, and cloves and cinnamon--and old parchment, and leather, and boards, and dust." The keeper, Peter de Quincey, tells him the spice is "an excellent preservative of old books." As the murders mount and Chaucer turns testy, Gower is unsure whom to trust. His estranged son's return to London further upends his life. But as he plumbs the sleazy world of paid mercenaries, rivalrous courtiers, and bishops' bawds, the secrets of the treasonous text reveal deadly ambitions.